Few days before Christmas, entertainment personality, Richard Mofe-Damijo (RMD) openly made a confession to his wife, Jumobi Adegbesan Mofe-Damijo. The occasion, which was an event on the Lagos Island that had personalities from all walks of life in attendance, saw him telling guests at the event that one thing that remains precious to him in this world is his wife, Jumobi. In his own words: "My wife is the most precious thing in my life and despite my weaknesses and lapses, she still takes me back home and loves me unconditionally. If you are watching me, I love you!" 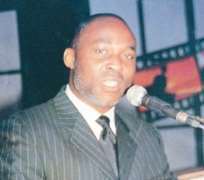 Though the wife was absent at the occasion, some guests and fans of RMD wondered why he made such a confession at that occasion, some others believed he was just happy that Christmas was around and needed to show his wife that she means the world to him.